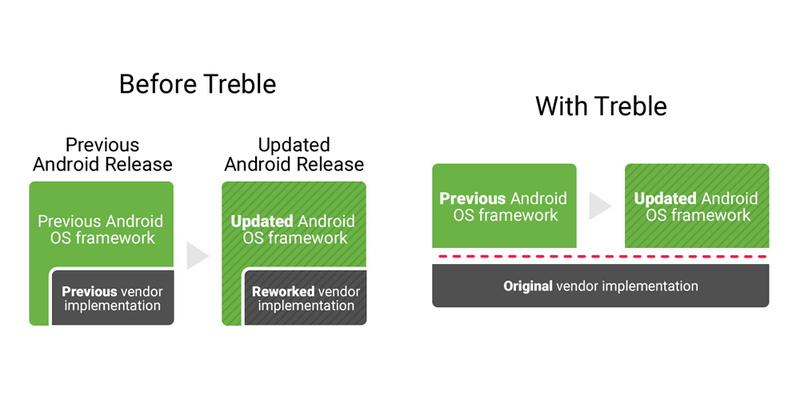 Project Treble, Google's idea to speed up Android updates, could be the expected answer to the problem of Android fragmentation. This new architecture, announced last week and debuting with Android O, aims to separate the operating system from vendor implementation, the part containing the many proprietary drivers (Qualcomm, MediaTek, etc.) and their binary blobs, since, in fact, it is one of the most often cause for most problems in major operating system updates. Project Treble is a partial rewrite of Android running that will focus on two separate parts. The first composed of services, applications and graphical interface, which make up what we see of the operating system. The second delegate to a dialogue between hardware components (such as the processor, sensors, antennas) with the rest of the system. And here comes the key news. Only smartphones that leave the factory with Android O can benefit from Project Treble. The translation of this is logical: none of the current models in the market will support such novelty; except Google Pixel. Dave Burke, vice president of Android development, initially confirmed that the Pixel and Pixel XL would support Project Treble, giving hope, at that time, to owners of other Android smartphones. Recently, however, Google released information regarding the timeline of updates for the Pixel, making it clear that they will only have two years of major updates. And although Project Treble could change these deadlines, for now it does not seem something really doable. Since these are devices developed by Google itself, the means used can be virtually infinite, if the company wishes, but considering that has never been so far, does not seem to make much sense now. The changes made in the past by Google make think of a project to expect a lot, but waiting almost nothing.